We are rich with tea traditions. Since Europe discovers it’s own taste of tea, Latvia had been constantly under great influences coming from different tea cultures – East and West. When these two cultures landed in our country, they had found local traditions of brewing herbs and unique tea culture has born. We are proud to be locally based and locally owned tea company, who does understand needs and tastes of both big swings. Besides we have are committed to revive best from famous tea traditions of world nations and spreading them beyond. That’s why we’ve transformed themselves from merchants to producers and tea packers, created own style of tea- houses and developed label „ApsarA” what is in market since 1992. In year 2000 producer&owner of "Apsara" teas - "Bargi" Ltd., has decided to created another company in close association with the brand. Thereafter "Apsara" Ltd. has founded. Since then "Apsara" Ltd. and "Bargi" Ltd. are working close, hand in hand, to achieve common goal - to represent best world's teas and spread it's popularity. 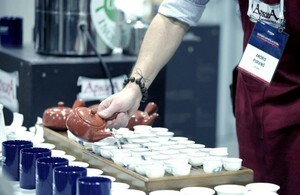 ​We’re Latvian tea company which create and produce distinctive teas under own registered brand “APSARA” since 1992. We select teas directly from China, India, Srilanka, Japan, Indonesia, Kenya, Brasil, South Africa, EU and Latvia. From year of 2014 we’ve turned to healty tea, which are blended only from natural ingredients. We are proud to offer full set of black, green, herbal and fruit tea blends consisting only natural spices and herbs. 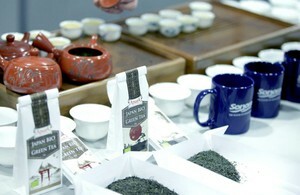 ​We are independent producer since we have our owned tea factory in Riga, where we’re blending and packing our teas.